SCRIBBULUS : HP gossip, dirt and news. | Bored of Harry Potter news sites that report so seriously about something so fun? We are. Hopefully we’ll be back soon with regular gossip updates. Pst. We’re still here…but the gossip is not. Got a story for us? Email! Scribbulus[at]hotmail[dot]co[dot]uk! The Mirror (that oh-so-reliable news source) is reporting today that there are plan for a Harry Potter musical. Casting agencies are supposedly on the lookout for a young chap to play the part of Harry. They’re also looking for a ‘big name’ writer to write the score. May we suggest “Harry Potter – superstar! Rescued by Hagrid on a Yamaha!“? A short video interview with Rupert Grint at V Festival is now online. See his snazzy goggles! See his Elvis impersonation! Hear his impression of a can of squirty cream! I knew there was a reason I always liked Rupert…. Click pic for vid link! So. It turns out the detective novel story was completely false. Oh, what a surprise! Like we didn’t see that one coming or anything. When contacted, Ian Rankin said “This is a joke that got out of hand“. He should know better than to joke about something so deathly, DEATHLY serrrrrious. A short (18 second) but sweet video made, presumably, on someone’s mobile phone shows Emma Watson and Tom Ducker walking through a park on their recent holiday together in France. Click the screen grab to check it out! 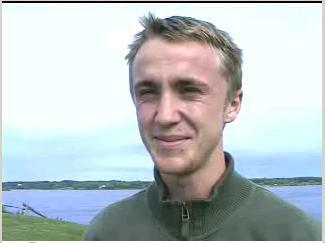 Tom Felton is currently over in New York making an appearance at the Junior Carp Fishing Championship and a video turned up on a news site making us giggle. A lot. Don’t know why this is so downright hilarious but it is. You can watch a video of his discussing the joys of fishing and helping children to fish here.